At one time mortal combat was an accepted way of life. Sadly, it still is in some parts of the world. Humans are a violent breed. These days, we just want to get a parking spot or walk down the street without crossing the path of some nut. But at what point in an altercation do we decide that lethal force is the only viable means of ensuring our safety? Some so-called self defense techniques are decidedly offensive in nature, if for no other reason the alternative is our own demise. Certain techniques do have humane intentions but can go awry. For example, applying pressure to the carotid arteries located on the sides of the neck via a submission style choke-hold will induce unconsciousness, but this same maneuver can prove to be fatal in the hands of a novice. In the heat of the moment, anything can happen. A while back, I posted a story about a tourist who killed a would-be robber with a crushing headlock. It may not have been his intention to kill, per se, but it just goes to show what can happen given the right (or wrong) set of circumstances. Recently, I observed a knife-disarming technique that I found interesting. It concluded with the defender removing the weapon from the attacker and then using it against him. ME: You just killed that guy - with his own knife? INSTRUCTOR: No, it's self defense. Realize that the chances of any witnesses being present during this rather unlikely scenario are about zip. Coupled with the fact that your fingerprints are now on the weapon, you have some major explaining to do. When Shakespeare wrote, "let's kill all the lawyers", he never could've imagined this. Even Bernie Goetz, the hapless New York commuter who shot and maimed a quartet of subway riders back in the 80s because he believed they were about to rob him, did time for his deed. Whether he acted recklessly or appropriately is highly debatable. There have been cases similar to Goetz' where the victims who turned the tables were justfied in their actions and eventually cleared. Better to be tried by twelve than carried off by six. I haven't looked into the details for a long time, but last time I did look, it seemed to me that the law in most places pretty much answered the whole question in a reasonable way. Unless things have changed, in most localities you are permitted to use lethal force in self-defense if you are in reasonable fear for your life or safety. This seems like a good standard even if it's not the law. In the example you cite, the question would be, once you've taken the knife away, are you still in reasonable fear for your life? There are some people out there of whom I might be in reasonable fear; others might not concern me as much. If in such reasonable fear, killing the man might be justifiable, but to kill a man of whom you no longer reasonably have anything to fear strikes me as quite unjustifiable, and possibly going right over the edge into vigilantism. Goetz was convicted because it involved a firearm which on the subway was illegal. If you are going to go that route be sure that everything you use or carry is legal. I had a security guy at a hotel I worked at come in with shuriken in his pocket. I asked him why and he said in case and I said illegal in Florida and he got rid of them. He would have gone to jail for two years if caught with them let alone made use of them even as a security guard doing his duty. Killing aside, we have to also worry about an "excessive force" charge, something that is easy to stick a trained martial artist with. I know someone facing this right now. American Kenpo has a technique in which a skilled martial artist can move the person in such a way that they (the attacker) will actually plunge the knife into their own femoral artery. I wonder who would be guilty of murder in that case? Once a person is disarmed of their weapon, I think it goes too far to finish the job. 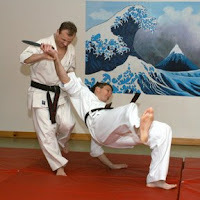 Most martial artists are trained how to break something to prevent an attacker from being able to come back at you. I think that would be the safer route. Disarm, break, and then put your running shoes on. Of course, if you take this scenario and remove it from the street and put it in your own home which someone has just broken into and you have two kids upstairs, then the outcome could be a lot different because it's not just about you anymore. We have learned ways to use a knife against someone if they're still holding onto it, but not once they no longer have a hold on their own weapon. ...to kill a man of whom you no longer reasonably have anything to fear strikes me as quite unjustifiable, and possibly going right over the edge into vigilantism. Unjustifiable, definitely. A vigilante is a person who takes things upon her/himself; they're laying and waiting, which is what Bernie Goetz was accused of. True self defense emerges from spontaneity; it's rooted in training, but not premeditated in the normal sense. That was the beginning of it. But the media turned the whole thing into a circus. What's interesting is that since that time, crime had dropped dramatically in New York, especially subway crime. I don't know how it works in criminal courts regarding martial artists. The hands held as "registered weapons" is an old urban myth - remember that one? But in a civil case, watch out. I know that one, and another similar to that. Well, that changes things a lot, because it's the attacker's fingerprints on the weapon, not yours. You could always argue that the attacker simply fell on the weapon. Most martial artists are trained how to break something to prevent an attacker from being able to come back at you. I think that would be the safer route. Disarm, break, and then put your running shoes on. Agreed. And I was always taught to do unto others - then run. I think the way the law reads, once someone is in your home, especially if you can show they broke in to commit a crime, all bets are off. Even if they're trying to escape, they're dead to rights in the literal sense. This probably goes everywhere. I abhor violence but would have no problem killing an attacker if he threatened me or my families life with a knife or gun. However, there are techniques where you can maim an attacker without killing him, if given the choice I would shoot or stike the legs first to immobilize. He cant attack you if he cant chase you. Many of the techniques I've learned to disarm an opponent would, if done properly (and there's no guarentee in a live situation that I'd excecute the moves perfectly!) have the potential to seriously hurt, if not kill, an attacker. I think that in spite of everything, training, etc, it's very hard to say what any of us would do in such a situation. I know someone who trained in Judo for years. She had the misfortune to suffer a really serious attack - and she went to pieces. Training can help us understand who we are, but sometimes reality can teach us another kind of lesson. However, there are techniques where you can maim an attacker without killing him, if given the choice I would shoot or strike the legs first to immobilize. He cant attack you if he cant chase you. The key phrase here is given the choice, but usually our choices are all wrapped up in the moment. I generally agree with your comment, but you never know how it's going to go down until it actually happens. Knowing how to do something is very different from actually doing it. I think that in spite of everything, training, etc, it's very hard to say what any of us would do in such a situation. I know someone who trained in Judo for years. She had the misfortune to suffer a really serious attack - and she went to pieces. This really mirrors what I just said above. I hate hearing stories like that, but the thing is, that's reality and it serves as a wake-up call to those who buy into the myth that martial artists are or should be invincible fighting machines. "Would I really be able to handle myself?" is a perennial question for many martial artists. In our weapons class, or in our regualr classes (TKD, Jujutsu, etc) our instructors always make the point of telling us that doing just enough to keep them from hurting us, keeps both of us safe. Disarm, counter with a non-leathal technique, and get the heck out of there. Your point of asking who the police would blame for a death isn't disscused as often as what would happen if the cops showed up after a fight had begun to find one of us pounding on the other guy. Obviously we defended ourself, but needlessly pounding on them is bad ki. ...our instructors always make the point of telling us that doing just enough to keep them from hurting us, keeps both of us safe. Sounds noble and ethical, but it would really depend on the situation. A drunkard is not the same as a slasher. Different intents of attack should elicit different responses. ...what would happen if the cops showed up after a fight had begun to find one of us pounding on the other guy. First, you'd have to post bail, then you'd need some legal representation. Interestingly, a lawyer friend of mine who did TKD once told me if you ever beat the tar out of someone (especially if your identity was knowable), the best thing to do would be to call the police - immediately. "I don't know how it works in criminal courts regarding martial artists. The hands held as "registered weapons" is an old urban myth - remember that one? But in a civil case, watch out." "I think the way the law reads, once someone is in your home, especially if you can show they broke in to commit a crime, all bets are off." "the best thing to do would be to call the police - immediately." Very very interesting. Logical, but that would not have been my first choice of action. Thankfully, I have been in no real life-threatening situation and if I'm lucky enough, I won't be either. Laws vary greatly as to how MA are treated, but still, shouldn't they be treated like everyone else? Again, it really depends. The DA's office would do a background check on the defendant, and whatever gets turned up would determine the outcome of a criminal case. Lawsuits work differently and allow for greater interpretation of the law. If I'm wrong about any of this, you can sue me! I honestly hope that I'm never placed into the position of having to make this kind of decision in my life.